Indian shooting team left early morning today to participate in the ISSF World Cup in Changwon, Korea from 2 April to 10 April 2013. The 30-member team which includes Olympic medallist Abhinav Bindra and Vijay Kumar looked very confident after a training camp in Delhi. This is the 1st World Cup of this year for the rifle and pistol shooters and will be played with the new ISSF rules. Major changes include new finals for all Olympic events where all finalists start from zero. This means that qualification score will not be carried into the final anymore, making the scoring immediately understandable for the spectators. Furthermore, all finals feature elimination, and end with duels between the two best athletes to decide the gold and silver medals. This step was taken to engage a worldwide public by attracting spectators and fans through an appealing and easily understandable competition format. Although the Indian shooters got introduced to the new rules in the recently held two selection trials but it will be very interesting to see how they perform at this World Cup with the new rules. 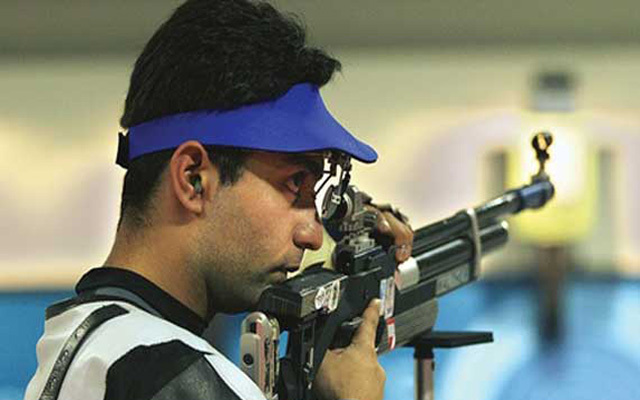 Beijing Olympic gold medallist Abhinav Bindra will be competing in the 10m Air Rifle event along with Sanjeev Rajput and Chain Singh while Gagan Narang decided to skip this World Cup. The new rules should be good for Abhinav as has always been a good finalist. Way back in 2003 World Cup, Abhinav had narrowly missed a bronze at the same venue after he had qualified with a score of 596 but was unable to find a podium finish then. But times have changed and so have the rules. It is also good to see Heena Sidhu who recently got married, back into business as she will be competing in the Women’s 10m Air Pistol event. Heena had a taken a break after her marriage and missed the last National Championship and the selection trials. The team is a mix of experience and youth, with the youngest member being Akhil Sheoran at 17 years.